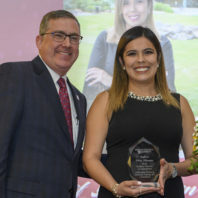 Pérez-Páramo is a Fulbright Scholar who came to WSU from the Universidad Autonóma de Nuevo Leon in Monterrey, Mexico, where she completed her master’s degree in molecular biology and genetic engineering. This is not the first time Pérez-Páramo has been recognized for her work, within the past year she has received recognition from several international research organizations for excellence in collaborative research and scholarship. She works in the research lab of Philip Lazarus, and together they are studying how genetics effect the body’s reactions to and removal of nicotine, the addictive agent in tobacco products, and tobacco carcinogens, and if these genetic factors can be used as markers of tobacco addiction or cancer risk. If her research is successful, Pérez-Páramo could be able to determine how likely a smoker will develop nicotine addiction or cancer based on his or her own DNA. In addition to her studies in pharmaceutical sciences, Pérez-Páramo is active in her local community and the scientific community. She serves as the programs director for the WSU chapter of the Association for Women in Science (AWIS), which was recognized for its activity in STEM advocacy this past year. She also serves as a mentor for the NY Academy of Sciences program, “1000 Girls, 1000 Dreams,” that helps to empower high school girls that are interested in STEM from undeserved areas in Mexico.